I lucked out and managed to grab a copy of the new Full Disclosure edition of Apocalypse Now on Blu-ray from Amazon during one of their lightning deals as part of the Thanksgiving / Black Friday / Cyber Monday feast of deep discounts; it was only $29.99, half the $59.99 SRP. George Lucas was originally going to direct Apocalypse Now on location in Vietnam - in the late 1960s/early 1970s. No doubt that insane idea served as the genesis for Ben Stiller's Tropic Thunder. The purchase turned out to be an opportunity to rediscover a truly great movie. Watching Francis Ford Coppola’s masterpiece (heck, the guy has made several masterpieces) on Blu-ray is truly awesome. Fully restored, with 5.1 DTS-HD Master Audio. What Coppola managed to put on film is nothing less than staggering. And it’s fantastic the documentary Hearts of Darkness completes the set of Apocalypse Now and Apocalypse Now Redux (the extended cut, restoring 9 minutes of footage, released in 2001). The feature-length documentary provides insight into the madness that went into making the movie that goes beyond the typical happy-go-lucky on-set interviews used as fodder for behind-the-scenes featurettes. I was fortunate enough to meet Francis Ford Coppola at a convention once upon a time and he autographed my laser disc copy, which to this day is proudly housed in the Mattsonian. But the quality of that (at the time top-of-the-line) home video format doesn’t hold a candle to the new Blu-ray. The movie. Wow. Watching it now, more than ever before, I’m blown away by the monumental achievement in filmmaking. Originally released in 1979, that was long before today’s era of CGI-laden movies. The composition of the imagery, particularly during the technically-complex scenes of combat, is breathtaking. Everything is going digital these days, and society will ultimately lose a little something in the transition. Well, it already has. Something very special. Newspapers and printed books are being replaced by digital editions distributed via the Web and read on computers or mobile devices. That tactile sense of touch, of paper - of earthiness - is getting lost. And so is the organic sensation of filmed action, which is being replaced by digital animation. There’s simply no comparison and, 31 years later, Apocalypse Now is proof positive of the notion that filming on location, with real-world effects cannot be matched by technology’s artifice. 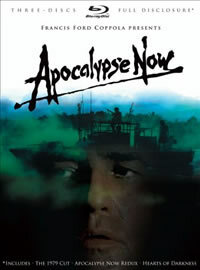 Apocalypse Now was nominated for eight Academy Awards, including Best Picture and Best Direction, but it won only for cinematography and sound. What movie won for Best Picture and Best Direction that year? Coppola did take home the Oscar for directing The Godfather Part II (not the original, though, and not for Part III, either), but that win was five years prior to Apocalypse Now. That’s not to slight director Robert Benton. In 1978 he co-wrote the screenplay for one of the best comic book movies of all time, Superman: The Movie. But with everything in the rear view mirror, lauding Kramer vs. Kramer at the expense of Apocalypse Now seems all the more egregious today. Coppola and Benton are roughly the same age, only 7 years separates them, with Coppola being the younger. Both are still actively making movies. But on Feb. 27, 2011, it will be Coppola who is honored with the Irving G. Thalberg award during the Academy Awards ceremony. “Do you know that ‘if’ is the middle word in ‘life’?” That was Dennis Hopper’s character, a hippie photo journalist, quoting Col. Kurtz, played by Marlon Brando. How would Coppola’s life be different if, after a typhoon wiped out the movie’s sets in the Philippines, he decided to pull the plug instead of forge ahead?